The Ultimate DIY Sealer Is... Crisco? Curlies are known for using weird things in our tresses. We are not shy about adding what most would cook or blend as a meal and put onto our hair, because we know the benefits they offer us that our straighter-haired friends would not be caught dead using. It is perfectly ok to skip the tasty guacamole for a deep conditioning masque or bypass sautéing a dish with that olive oil to seal our ends. To know us is to understand this side of us, so as I peak your interest with Crisco, do not frown up it! You know I am going somewhere good with this. 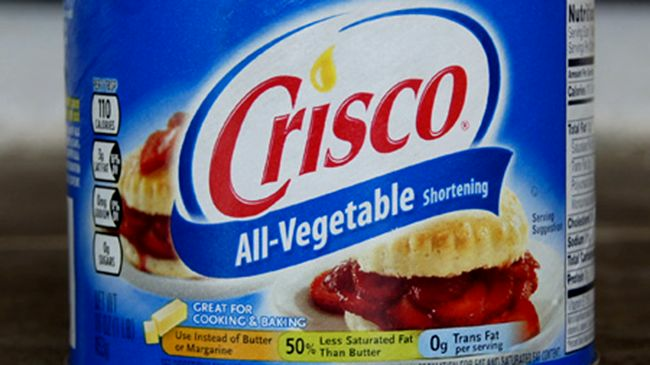 If you do not know, Crisco is a shortening produced by the J. M. Smucker Company and introduced by Proctor & Gamble in 1911. It is made from vegetable oil and the ingredients include soybean oil, fully hydrogenated palm oil, partially hydrogenated palm oil and soybean oils, monoglyceride, diglycerides, TBHQ, and citric acid (antioxidants). The good thing is we are not talking about eating or cooking with it but rather using it in our hair. According to Livestrong, Crisco has been recommended by some dermatologists for dry skin and other skin conditions like eczema. It is quite effective at sealing moisture in your skin and hair. Vegetable shortening has been used on the body for centuries, so it should not come as a surprise it has resurfaced again for hair. Now that you know that Crisco is just an oil in solid form, are you ready to use it in your mane? If not, are you just intimidated by that big blue can that many remember seeing their mothers and grandmothers having on the kitchen counter? No one is saying scoop out a handful and slather it in your head. There are mixes for this effective and reasonably priced sealant, so do not shy away just yet. I think the most popular one has to be from Calvis Williamson, the creator of the Sugar Foot Hair Short’nin that has the wonder ingredients soy bean and palm oil. She is lovingly called “the Crisco kid” and Facebook natural hair groups have been talking about her DIY styling mix for a while. She made a video creating it prior to selling her Sugar Foot Hair Short’nin and her ingredients include Crisco, gel, conditioner, glycerin, and extra virgin olive oil. She is far from alone, as more naturals are loving and mixing Crisco into some amazing concoctions. Naptural Nicole created one to that is worth mentioning as well as trying. Slightly softened in the microwave. Mix shea butter thoroughly and add your oils and gel and stir. The consistency of the product should be a thick cream. The product should run when placed on the back of your hand. Apply to clean, freshly washed/cowashed hair and style. There are several ways to create a Crisco mix that will benefit your hair and skin and all you have to do is use what you love or whatever you have in the kitchen. What may seem weird may just be a different way to achieve the same results: happy, healthy, and well-moisturized tresses, and that is worth thinking outside the Crisco can. Have you tried Crisco in your hair?